In stock. Order in the next 12 hours, 8 minutes and it will go out today! This is another version of Wilting Rose or Dropping Flower. However, in this version the magician holds a bouquet of flowers instead of a single flower. Effect: The performer holds what looks like a bouquet of flowers. He says that the flowers are magical, and never need water to keep them healthy. He tells the children to show how the flowers droop down if they are not watered properly. The children all hang their heads as an example of a wilting flower. As the magician is talking, the children notice the flowers split and drop down mysteriously. However the magician doesn't notice! Naturally the children bring the wilting flowers to the magicians attention. 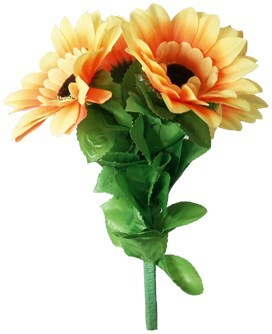 To their surprise the flowers instantly return to their up right position! The magician asks the children what happened to the flowers. The children explain, and at that moment the flowers begin to wilt again! Once the magician notices the flowers wilting the children shout the magic word and the flowers return to their former glory! This is an excellent effect in the hands of the right performer!